Are you searching for a solution to transform your lawn into the lush, healthy one you desire? Different from fertilizers, soil amendments, such as compost and lime, can come to the rescue. Soil amendments, also called soil conditioners, can often be overlooked and confused with fertilizers. However, they are not the same. Each plays a different and vital role to nutrient-packed soil. Here we’ll discuss features soil amendments can offer. Going beyond just adding nutrients, like fertilizers do, soil amendments provide maximum conditioning. The goal of soil modifications is to prepare the soil to tilth, or physical condition best suitable for growing. This provides your plants, lawns, and landscaping the highest potential to grow, especially when done early on. 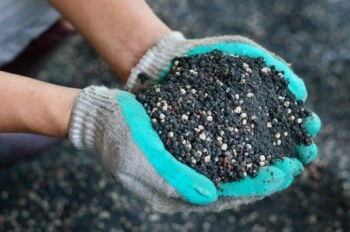 As with the concept of fertilizers, these amendments make the garden’s growing ability superior, roots penetrate the soil easily, and water infiltration improves. These modifications also maximize plant nutrients. In new lawns under regular cultivation, soil modifications are mixed into the soil before the planting begins. In established ornamental plantings and turf, gardeners apply the soil amendments to the surface, then water them properly. Different from mulches, which sit atop the soil, amendments reach further down below the exterior. Fertilizers affect plant growth directly. Soil amendments, on the contrary, affect the development indirectly. They can also deliver additional nutrients, but they are not an alternative to fertilizers. Well-rotted leaves, finished compost, and other organic materials enhance the way soil particles fit together. Natural materials help the soil hold water, absorb nutrients, and stimulates microorganisms. As the soil pH becomes alkaline, seasoned gardeners recommend the use of elemental sulfur. To get started, mix it into the soil. Or, you can apply them in a granular form. Be sure to use enough water. Sulfur is advised over artificial options because it significantly lowers the soil pH in a short period of time. Keeping the soil pH in ideal condition is key. Gypsum can help. It specially modifies soil without affecting its pH. While it promotes water penetration, it loosens compacted soil and boosts fast root penetration. When looking for a gypsum, choose one that improves the solid structure, maintains the pH level, and adds enough calcium. Lime can benefit the lawn and other plants as it is used to restore the balance in soil pH. Rich in calcium, lime can raise soil pH in a snap and boost nutrient absorption. A lively and colorful lawn of your dreams will be a reality. This boosts the aesthetic appeal of your home and promotes quality air. Soil amendments are an essential ingredient for an attractive and lush lawn.